No catchy name here. This is the pasta salad I grew up on. The catch – my mother was a great cook so she taught me the secret to all cold pasta/potato dishes. The combination of sweet, salty, sour in perfect balance applied to any warm starch is the trick. When these elements are in place, simple is perfect. 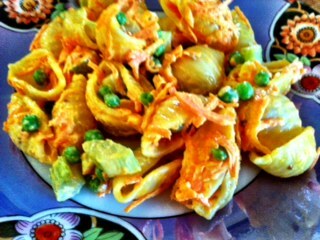 This entry was posted in Recipes and tagged Carrots, celery, Frozen Peas, Pasta Salad, salad. Bookmark the permalink.